Total Speculation: Is LAN leaving the oneworld Alliance? Effective immediately, no new codeshare bookings may be created for AA*/LA (LAN Airlines) flights. This includes newly created bookings as well as making changes to previously created/ticketed PNRs. Please advise customers that the booking restriction will continue to remain closed for sale until further notice. Thank you. LAN and TAM completed a merger earlier this year and formed LANTAM Holdings. LAN is a member of oneworld and TAM is a member of Star Alliance. 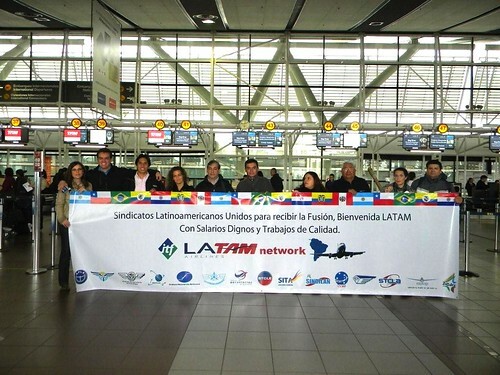 Regulators insisted that the newly formed company choose a single alliance, and they also excluded LANTAM from joining the same alliance AviancaTaca. AviancaTaca joined Star Alliance this summer and TAM announced that they would be leaving, but they didn’t say that they were joining oneworld. We’re carefully evaluating this issue and we will decide make a decision within an established deadline, taking into account the alternative that offers the best benefits to our clients. For the moment, LAN continues with oneworld and TAM in Star Alliance. We will inform you of any coming up changes. If LANTAM is excluded from Star Alliance and they’re leaving oneworld, does this mean they’re joining Sky Team? Or maybe, just like Emirates, they’re going independent? Well since we’re just speculating, I read an interesting post by Mark Mercer, of The Fuzzy Wanderer blog, where he suggests that LAN’s endgame is to find a way to exit oneworld and join TAM over at Star Alliance. To fully see his point, you should first read his thoughts here (the post was written before AviancaTaca joined Star) and then read his comments at the end of this Air Transport World article “LANTAM looks to late 2013 decision on alliance”. Such intrigue, it’s like following a telenovela. What do you think? The only thing more fun than speculation is winning AAdvantage Miles! Don’t forget that The Frugal Travel Guy’s Monday Deal of the Day is sponsored by AAdvantage. Share your best AA or AAdvantage related tip for a chance to win 2,500 AA miles! At first thought I selfishly hope they go over to SkyTeam, but then like Gol’s partnership with Delta, their flights will probably become impossible to find. For me, South America ex Brazil is the only area where OneWorld has a significant advantage, every other region I can do just as well with Star or SkyTeam. Seems rather sudden for an alliance change, often those things lumber on for awhile – and typically there is a winding down period after it’s announced. Though I suppose it could happen quickly if someone wanted it to. Could there be some hiccup in AA/LA’s codeshare agreement they’re trying to revise or iron out? Technical issue? I have a freind that works pretty high up in LAN and he’s told me off the record with Aerolineas Argentina joing Skyteam there’s little to no chance of LANTAM switching to the Skyteam. They have to much of an advantage by being the only Latin America Based OneWorld Carrier, Have hubs in just about every major city in Brazil, Paraguay, Peru, Ecuador, Colombia, Chila, and Argentina and hold a dominance market in South America. LanTam Buenos Aires base is still very small, but that’s due to protectionism from the government as they shield Aerolineas Argentina from a much better product. However, I would LOVE to see LANTAM in the SkyTeam, with GOL’s tieup with Delta and Aerolineas Argentina in the Skyteam, you can almost forget about it. There are more than 250 arlines that have gone bust this year alone so mergers are definitely on the agenda across the industry. Add to that the arguments over GDS distribution with the major OTAs and online booking systems at play and it is definitely a turbulent industry. SOmeone once asked me how to make a million with an airline. I said start with a billion! Not a good industry at the mo for investment.